A year ago, Vietnam was being hailed as the next Asian miracle, a success story to match the rise of the Asian tigers of the 1990s and more recently the stunning growth of China and India. Thanks to economic reforms, the communist country was attracting record amounts of foreign investment. The economy expanded by 8.5% last yearamong the fastest rates in the regionand housing prices doubled and tripled, driven up in part by frantic buyers who stood in line to snap up condos before they had even been built. The country's nascent stock market was minting millionaires. In Hanoi and Ho Chi Minh City, their flashy new cars clogged roads better suited for bicycles. But a funny thing happened on the way to prosperity. Halfway through 2008, Vietnam's authoritarian government finds itself grappling with soaring prices, collapsing markets and an increasingly restive workforce. Inflation, now running at an annual rate of 25%, is eating up much of the gains made by citizens over the last several years. Vietnam's stock market, which has fallen 58.5% since January, currently holds the unhappy title of being the worst-performing in the world in the last 30 days. Citing the government's difficulty in reining in inflation, Moody's, which grades creditworthiness, lowered Vietnam's ratings outlook last week to negative from positive. Poor ratings signal that banks may have trouble meeting their financial obligations, undermining investors' confidence in the country. In a nutshell, the economy overheated and the government was too slow to respond, says Jonathan Pincus, chief economist for the United Nations Development Program in Vietnam. "It's how we got into this problem," he says. Inflation is causing trouble worldwide, of course, but it's particularly acute in Vietnam, where prices for virtually everything, from food to fuel to housing, have been spiking. Much of Vietnam's recent growth has been driven by its expanding manufacturing sector, but now assembly line workers' salaries are being outpaced by basic living costs. The result has been a rash of strikesunusual in communist Vietnamthat are hurting the country's image as a haven for multinational companies looking for alternatives to China for manufacturing sites. Over the last six months, there have been more than 300 strikes throughout the country. Most last only a few days, with management usually agreeing to small pay increases. In April, a company that manufactures sneakers for Nike agreed to give workers a 10% increase, or about an additional $6.30 a month. But that amount is not enough to make much of a difference when workers go to the grocery store. Prime Minister Nguyen Tan Dung told the country's National Assembly on May 31 that the number of households going hungry has doubled in one year. "The government understands and shares with the people," Dung said. "And sees it is their responsibility to try to best curb inflation." So far, Hanoi has moved to cool the economy by requiring banks to increase their reserves; the central bank has also raised interest rates to 12%. 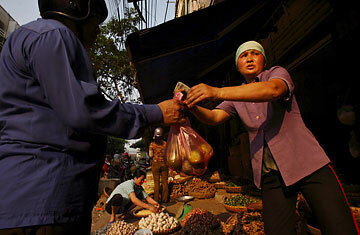 But inflation is being made worse by Vietnam's weakening national currency. The Vietnamese dong has fallen roughly 1.5% against the dollar in the past six months. But the recent dismal economic news is threatening to weaken it further. This past week the dong jumped from 16,120 to the dollar to 18,500 on the black market as traders rushed to put their dong into dollars and gold. The currency swoon makes imports, from food to commodities, more expensive. Jocelyn Tran, whose Ho Chi Minh City company contracts with local factories to supply apparel to U.S. stores, says the price of Chinese-made yarn has jumped 15% this year. "Our factories are absorbing it by cutting out the profit margin," says Tran. Even though some factories have raised wages, she complains that workers are still going on strike. The government in Hanoi has been slow to tackle some of the problems in part because battle lines are no longer neatly drawn between Communist Party hardliners and the party's more liberal economic reformers. Decision-making has been fragmented to the point of paralysis, says Pincus. For example, no single entity is in control of monetary policy. In a system that works on consensus not just among the party but committees, ministries and provincesit has been difficult to get leaders to make tough decisions. "It's always harder to distribute the pain," says Pincus. "It's much easier to distribute the goodies." To tackle inflation, the government knows it needs to raise interest rates and rein in spending, particularly by state-owned enterprises that have used state financial institutions as their own piggy banks. But any sudden moves can also threaten to strangle businesses and scare away new investors, which Vietnam must avoid if it is to meet its revised 7% growth rate. Still, while the numbers look bad now, Vietnam's long-term economic outlook is good, says Tom Nguyen, head of global markets at Deutsche Bank in Ho Chi Minh City. Some think the government's ability to deal with public dissent swiftly and harshly lessens the threat that strikes will turn into violent protest or will encourage calls for political change. Vietnam remains a stable country of 85 million people with a young and educated workforce. "It is unreasonable for any of us investors to expect this development process not to have challenges," says Nguyen. "But some of the heartache has to fall in the lap of the people who had unrealistic expectations." Unfortunately, most of the heartache will be felt by Vietnam's poor as they struggle to put food on the table.